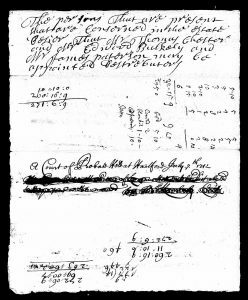 In my previous post on Connecticut probate records, I described how it is now possible to access digitized images from original probate files, and that I am busy comparing published transcriptions for the John Hollister family to the images of the originals. So far they differ mostly in such things as whether or not the original spellings were kept, although I am still making my way through the records. In the case of Lazarus Hollister, however, I came across an interesting corollary to the point I was making – that published transcripts may be less reliable than original images, but in this case, a published transcript looked like it might provide “correct” information that cannot be read on the original image. 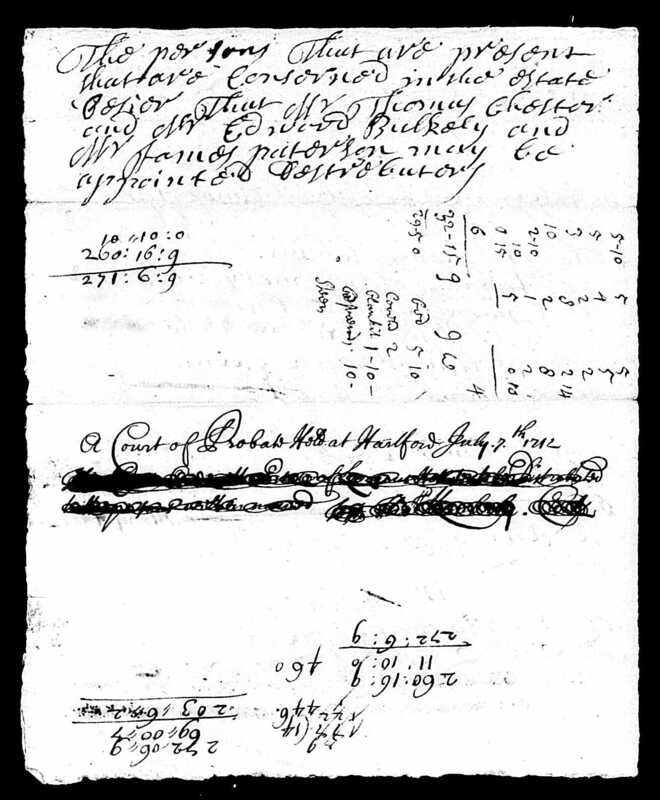 The digital image (shown above) reveals a scribbled list with words scratched out and a large blotch over the section purported by the abstract to include “the heirs of Sarah Blackleach (? ).” Looking at the succeeding image, which is the back of this leaf, it is clear that the blotch was from something crossed out on that side which bled through to the front, although there still is a section of the front which has been crossed out. Can you can find “Sarah Blackleach” on the image? Knowing from the abstracts that she should be there, I can just make out “Sarah” something below the blotch. So the next thing was to see if I could figure out who Sarah “Blackleach” might have been. 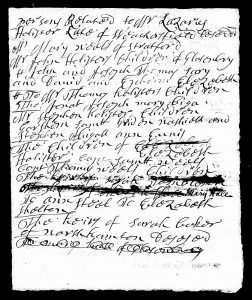 From her location in the list she is an heir of Elizabeth (Hollister) Welles, who married Samuel Welles, and her name precedes (with the scratched-out line in between) the names that were abstracted as Mary Hale, Ann “Welles,” and Elizabeth Shelton. 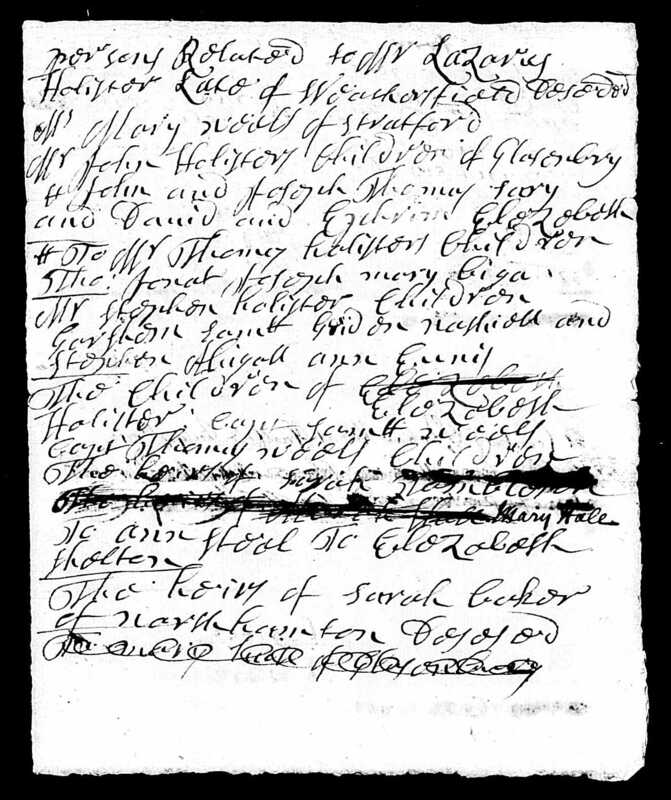 Samuel and Elizabeth had a daughter Mary, who married Samuel Hale; a daughter Ann who married James Steele; and a daughter Elizabeth who married Daniel Shelton. They also had a daughter Sarah, but she did not marry a Blackleach – her surviving husband was Agur Tomlinson. Now, look at the image again, could the name just below the blotch be “Tomlinson”? Donald Lines Jacobus et al., Hale, House and Related Families, Mainly of the Connecticut River Valley (Hartford: Connecticut Historical Society, 1952), 788-90. Brilliant! Without your additional research Tomlinson would never seem correct, but it certainly looks like it to me. Another important lesson. 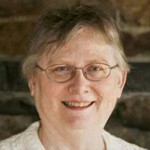 Carole, thank you. Sometimes it pays to look at things cross-eyed. I think the name may have been written as Tombleson. Jan, that is a very good suggestion. Thank you. Without knowing what other records suggest the surname should be, I would never be able to guess. (Even “Sarah,” which is not obscured, is challenging to interpret without being steeped in this handwriting.) If you told me it should be Blackleach, I could make myself believe that’s what it says. If you tell me that records suggest it should be Tomlinson, I can see that interpretation also. I found it interesting that it’s easier to capture an impression of the word from the smaller image than from the enlarged image, where one can get lost in each stroke of the pen. Ed, yes, a quick first look sometimes is much better than lingering over every letter. The original transcriber did what they could, but they had not researched the family, which, of course, is the point of the exercise.